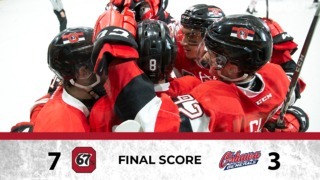 It was a goal fest in Oshawa on Friday night, where the Ottawa 67’s defeated the Generals by a score of 9-6 in an action-packed game. Seven different players lit up the lamp for the Barber Poles, including a hat trick for newcomer Kyle Maksimovich. The deadline acquisitions for the 67’s played a key part in the win, as Lucas Chiodo added four assists and Mikey DiPietro made 32 saves for the visitors. 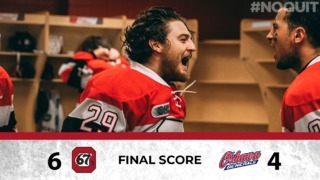 Chiodo and Maksimovich combined for eight points on the night, setting the table for an exciting rematch tomorrow afternoon at The Arena at TD Place. Maksimovich scored twice in the first period, with the other 67’s goals coming from Marco Rossi and Austen Keating in the opening twenty. Kyle MacLean and Nicolas Mattinen put the Gens on the board, with MacLean’s goal coming on the power play. Sam Bitten and Jack Quinn would both score to start off the second period, before Tyler Tullio and Anthony Salinitri scored back to back goals to make it an interesting score of 6-4. Maksimovich completed his hat trick, while Felhaber scored his 49th of the season just before the end of the second period, sending both teams to the dressing rooms with a score of 8-4 in favour of Ottawa, with another period yet to be played. Throughout the first two periods, the 67’s were outshot 29-25. Brett Neumann, Mitchell Hoelscher and Anthony Salinitri would add the games’ final goals as the final buzzer put an end to a 9-6 goal fest. 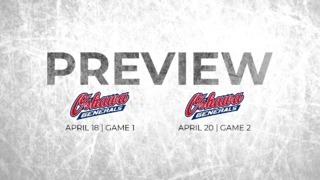 Ottawa will be up against the Generals for the second time in under 24 hours tomorrow afternoon at 3:30 PM at The Arena at TD Place, in a game that will be broadcasted across the country on Sportsnet.